Railway Station Branding Service in Delhi, Rail & Railway Station Hording Advertising Ad Agencies in Delhi. A Rail is massive space when it comes to advertising. Lots of space and all possible type of ads can be implemented in a metro rail. All possible places wherever commuters touch is viable space for placing an ad. The outer and inner surface of the trains, platforms, ceilings, corridors, escalators, stairways, all these places are available for placing ads. All types of ads like banners, posters, flex board, glow signs, bill boards, running displays, animation can be implemented in a metro rail. 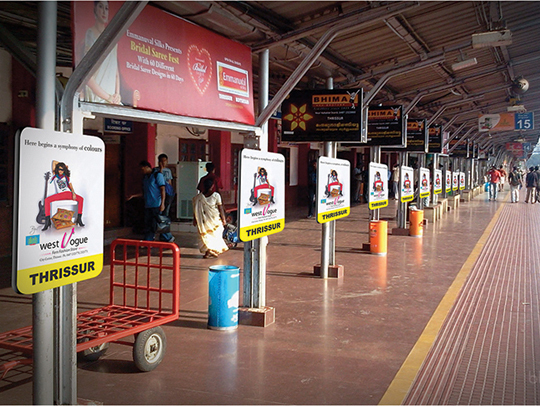 We have media on all major railway stations and have conducted many compaigns.